It was not until 2006 that the World Society on Abdominal Compartment Syndrome (WSACS, www.wsacs.org ) established consensus definitions for intra-abdominal hypertension (IAH) and for abdominal compartment syndrome (ACS). Thus, "the intra-abdominal pressure (IAP) is the steady-state pressure concealed within the abdominal cavity", while "ACS is a sustained IAP >20 mmHg [with or without abdominal perfusion pressure (APP) <60 mmHg] that is associated with a new organ dysfunction/failure". We try to briefly overview key aspects of ACS and abdominal hypertension in this article. It includes an historical review, a definitions summary, a pathophysiologic outline as well as management suggestions. Presenting in brief the history of the ACS is not an easy task; numerous problems arise, among which, the most important is the lack of consensus among scientists studying the history of this condition. When learning how to write an article on the history of medicine, the first advice given to students is never to use the words "first", "discover" or "founder", in an attempt to avoid disagreements from other researchers. Well, in this article, this advice should necessarily be forgotten, since the history of ACS is relatively new, meaning it appeared after publication in scientific journals came into our lives; and as we all know, he who publishes first, is the first to be acknowledged! The compartment syndrome was initially described in limbs by Richard Volkmann in 1811 in an article entitled "Die ischemischen Muskellδhmungen und -Kontrakturen". He described a condition in which increased pressure within closed fascial space reduces blood perfusion of the muscles and leads to a contracture. In 1911, H. Emerson experimented in dogs and proved that contraction of the diaphragm raises the IAP, while anesthesia and muscle paralysis decrease the IAP, and that increased IAP may cause death due to cardiac failure. His most important note was that cardiovascular collapse associated with "distension of the abdomen with gas or fluid, as in typhoid fever, ascites, or peritonitis" is caused by "overloading the resistance in the splanchnic area" and that "relief of the laboring heart is constantly seen after removal of ascitic fluid". Emerson was actually the scientist who built the foundations of the clinical and experimental research on IAP in the 20 th century. The history of the ACS is a typical one. First was the matter of identifying the importance of the increased abdominal pressure; then was finding the best way to measure it and understanding its effect on patients. Finally, it was not until the 1980s that the physicians identified the ACS and searched for the best methods to treat it. After 1990, the interest in the ACS was raised; nowadays, more than 100 scientific articles on the subject are published in medical journals per year. In 2004, the WSACS was founded and the interest on this condition took a formal and concise character. Originally thought to be a disease of the traumatically injured, IAH and ACS have now been recognized to occur in a wide variety of patient populations. Numerous risk factors have been suggested, and they are listed in [Table 1]. Bladder pressure measurements are not feasible in some patients. Those patients with bladder trauma, neurogenic bladders, outflow obstruction and tense pelvic hematomas will require alternative methods of IAP measurement. A nasogastric IAP monitor has been developed as well. Measurement through the stomach has some advantages; it avoids problems associated with creating a hydrostatic fluid column in the bladder and is easier for continuous measurement. In 2004, the WSACS was founded by leading international experts and currently serves as a scientific resource and a forum for establishing the concept of IAH and ACS in everyday clinical practice. ,,, The recognition of IAH as an independent prognostic factor for critically ill patients  will be gradually embedded in the "goal-directed" approach used in the ICU and will alter the decision-making process. In this review, the pathophysiologic aspects leading to IAH and IAP are elucidated with an aim to a better understanding of both the phenomena. The introduction of laparoscopic surgery in the 1990s was followed by extensive experimental and clinical study of IAH and ACS and led to an increased appreciation of their pathophysiologic sequelae. ,, These effects include the directly affected intra-abdominal organs, as well as indirectly adjacent or remote systems and organs. Transmural CVP = CVP - IAP/2. FG = GFP - PTP = (MAP - IAP) - IAP = MAP - 2 Χ IAP. The gastrointestinal system shows great sensitivity to alterations of IAP. Mainly two functions are altered: (a) the mucosal-barrier function (influencing both intermucosal nutrient flow and bacterial translocation) and (b) the gastrointestinal motility. 4.prompt surgical decompression for refractory IAH. Patients should be screened for IAH/ACS risk factors upon ICU admission and in the presence of new or progressive organ failure (Grade 1B). Independent risk factors for IAH/ACS are presented in [Table 1]. If two or more risk factors for IAH/ACS are present, a baseline IAP measurement should be obtained (Grade 1B). If IAH is present, serial IAP measurements should be performed throughout the patient's critical illness (Grade1C). APP should be maintained above 50-60 mmHg in patients with IAH/ACS (Grade 1C). Serial IAP measurements are necessary to guide resuscitation of patients with IAH/ACS. No recommendations can be made at this time concerning pain, agitation and ventilator dys-synchrony. Accessory muscle use during breathing may all lead to increased abdominal muscle tone. This increased muscle activity can increase IAP. Sedation and analgesia can reduce muscle tone and decrease IAP to less detrimental levels. While such therapy would appear prudent, no prospective trials have been performed evaluating the benefits and risks of sedation and analgesia in IAH/ACS. A brief trial of neuromuscular blockade (NMB) may be considered in selected patients with mild to moderate IAH while other interventions are performed to reduce IAP (Grade 2C). Diminished abdominal wall compliance due to pain, tight abdominal closures and third-space fluid can increase IAP to detrimental levels. The potential beneficial effects of NMB in reducing abdominal muscle tone must be balanced against the risks of prolonged paralysis. NMB is unlikely to be an effective therapy for patients with severe IAH or the patient who has already progressed to ACS. The potential contribution of body position in elevating IAP should be considered in patients with moderate to severe IAH or ACS (Grade 2C). Head of bed elevation can significantly increase IAP compared to supine positioning, especially at higher levels of IAH. Such increases in IAP become clinically significant (increase >2 mmHg) when the patient's head of bed elevation exceeds 20΀. Both air and fluid within the hollow viscera can raise IAP and lead to IAH/ACS. Nasogastric and/or rectal drainage, enemas and even endoscopic decompression can probably reduce IAP. Prokinetic motility agents such as erythromycin, metoclopromide, or neostigmine can aid in evacuating the intraluminal contents and decreasing the size of the viscera. Nevertheless, insufficient evidence is currently available to confirm the benefit of such therapies in IAH/ACS. Fluid resuscitation volume should be carefully monitored to avoid over-resuscitation in patients at risk for IAH/ACS (Grade 1B). Hypertonic crystalloid and colloid-based resuscitation should be considered in patients with IAH to decrease the progression to secondary ACS (Grade 1C). Fluid resuscitation and "early goal-directed therapy" are cornerstones of critical care management. Excessive fluid resuscitation is an independent predictor of IAH/ACS and should be avoided. The use of goal-directed hemodynamic monitoring should be considered to achieve appropriate fluid resuscitation. Diuretic therapy, in combination with colloid, may be considered to mobilize third-space edema following initial resuscitation and once the patient is hemodynamically stable. Continuous hemofiltration/ultrafiltration may be an appropriate intervention rather than continuing to volume load and increase the likelihood of secondary ACS. These therapies have yet to be subjected to prospective clinical study in IAH/ACS patients. Percutaneous catheter decompression should be considered in patients with intraperitoneal fluid, abscess, or blood, who demonstrate symptomatic IAH or ACS (Grade 2C). Paracentesis represents a less invasive method for treating IAH/ACS due to free fluid, ascites, air, abscess, or blood. Percutaneous catheter insertion under ultrasound guidance allows ongoing drainage of intraperitoneal fluid and may help avoid the need for open abdominal decompression in selected patients with secondary ACS. Surgical decompression should be performed in patients with ACS that is refractory to other treatment options (Grade 1B). Presumptive decompression should be considered at the time of laparotomy in patients who demonstrate multiple risk factors for IAH/ACS (Grade 1C). Surgical abdominal decompression has long been the standard treatment for the patient who develops ACS. It represents a life-saving intervention when a patient's IAH becomes refractory to medical treatment options and organ dysfunction and/or failure is evident. Most patients tolerate primary fascial closure within 5-7 days if decompressed before significant organ failure develops. 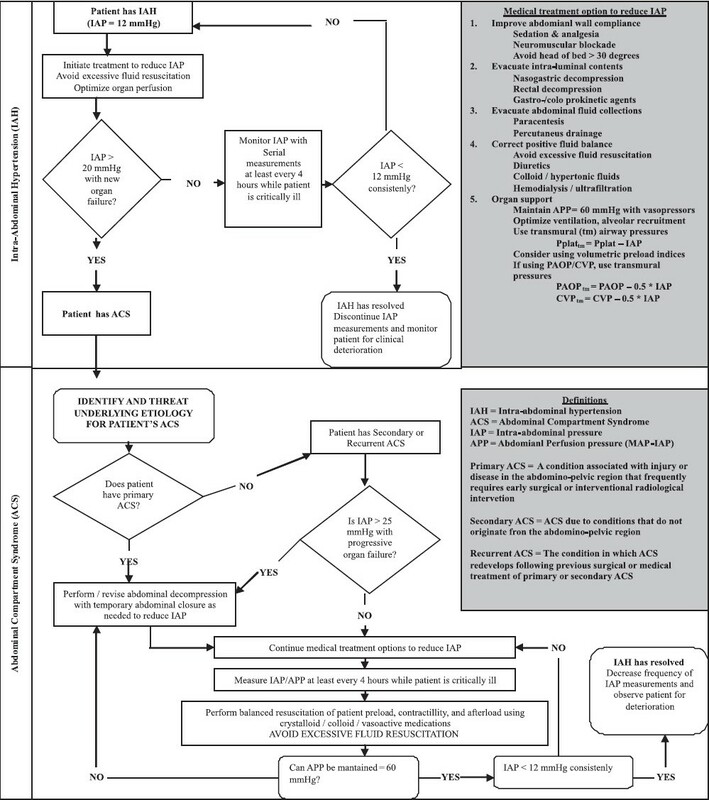 In [Figure 1] is summarized the IAH assessment algorithm and in [Figure 2] is summarized the management algorithm for IAH/ACS as proposed by WSAC. Management options for the "open abdomen" include split-thickness skin grafting, cutaneous advancement flap ("skin only") closure, and vacuum-assisted closure techniques (with or without retention sutures) bogota bag, zipper system, sandwich method, synthetic mesh, occlusive dressing under suction, and silicone rubber sheets. ,,,,,, Each of these techniques is associated with major shortcomings, including bowel fistula formation, retraction of the abdominal fascia, and intestinal adherence to the prosthesis. , Based on our experience using these techniques, some considerations emerged. Bogota bag is sutured to the abdominal wall or to the fascia, and it needs to be changed frequently until the underlying problem in the abdomen is solved. Peritoneal fluid cannot be quantified because of the frequent leaks of the wound edges. The use of Bogota bag is associated with a high incidence of skin excoriation and enteroatmospheric fistulas. Recently, an alternative method of Bogota bag was proposed. Instead of conventional plastic bags, a human chorioamniotic membrane prepared under sterile conditions is used. With this method, it is believed that serosal erosion and fistula formation can be prevented in patients undergoing open abdominal surgery. Zipper fasteners are less adherent to the underlying viscera; their use requires suturing of the prosthetic material to the abdominal wall tissues. Management of peritoneal fluid remains a problem unless a drainage system is incorporated. Closure of the skin only can result in leaks of peritoneal fluid, which saturates dressings and potentially allows contamination of the peritoneal cavity. Once zipper mechanism is used, there is serious difficulty for its repeated application. Sandwich technique proved simple in construction and is well-tolerated in the critical care environment. However, the use of sutures on the fascial edges seems to increase IAP, since recurrence of ACS occurred. Furthermore, when abdomen is left open for long enough, a fascial necrosis was observed. Placement of polypropylene mesh in temporary closure of the abdomen has been well documented. , It has been used with and without a zipper mechanism to allow for sequential abdominal re-explorations. Underlying viscera may adhere to the mesh and become injured during subsequent re-exploration. The mesh, if left for long enough in place, may erode into the bowel. Repetitive suturing of biosynthetic material to fascial edges damages the fascia and may be a causative factor of fascial necrosis development. Occlusive dressing under suction is the closest method to Vacuum Assisted Closure (VAC) technique. Technical problems were rare. Peritoneal fluid leaks were repaired at the bedside by application of additional adhesive drape over the leak site. This technique was abandoned because of the easiest application of VAC (KCI International, San Antonio, TX, USA) device in patients with open abdomen. It is essential that general and trauma surgeons understand the core principles underlying the need for and management of the open abdomen. Toward this goal, an Open Abdomen Advisory Panel was established to identify core principles in the management of the open abdomen and to develop a set of recommendations based on the best available evidence. This review presents the principles and recommendations identified by the Open Abdomen Advisory Panel and provides brief case studies for the illustration of these concepts. A comprehensive evidence-based management strategy that includes early use of an open abdomen in patients at risk significantly improves survival from IAH/ACS. This improvement is not achieved at the cost of increased resource utilization and is associated with an increased rate of primary fascial closure. However, prospective trials to identify the optimal management technique have yet to be performed. Multiple and profound physiologic abnormalities are caused by ACS/IAH, both within and outside the abdomen. Early recognition of increased IAP is primordial in the management. In order for this to occur, monitoring of IAP, either intermittent or continuous, is necessary to all patients presenting with risk factors. Additionally, understanding of the pathophysiology of ACS/IAH is of prime importance when trying to apply patient-tailored treatments. Moreover, surgical intervention should be indicated by IAH and not delayed until ACS is clinically apparent. We believe that every treating physician involved with patient candidates of developing ACS/IAH should be at least informed on the multiple aspects of the phenomena. WSACS (www.wsacs.org) provides, for this reason, an excellent place of ACS/IAH experts meeting point as well as useful updates concerning ACS/IAH. 1. Malbrain ML, Cheatham ML, Kirkpatrick A, Sugrue M, Parr M, De Waele J, et al. Results from the International Conference of Experts on Intra-abdominal Hypertension and Abdominal Compartment Syndrome. I. Definitions. Intensive Care Med 2006;32:1722-32. 2. Volkmann R. On ischemic muscle paralysis and contraction. Centralblatt für Chirurgie 1881;51:801-3. 3. Marey E-J. Medical physiology on the blood circulation. Paris: A Delahaye; 1863. p. 284-93. 4. Bert P. Lessons on the physiology of respiration. Paris: JP Baillière; 1870. 5. Emerson H. Intra-abdominal pressures. Arch Intern Med 1911;7:754-84. 6. Ogilvie WH. The late complication of abdominal war wounds. Lancet 1940;2:253-6. 7. Gross RE. A new method for surgical treatment of large omphaloceles. Surgery 1948;24:277-92. 8. Baggot MG. Abdominal blowout. Curr Res Anesth Analg 1951;30:295-9. 9. Kron IL, Harman PK, Nolan SP. The measurement of intra-abdominal pressure as a criterion for abdominal re-exploration. Ann Surg 1984;199:28-30. 10. Fietsam R Jr, Villalba M, Glover JL, Clark K. Intra-abdominal compartment syndrome as a complication of ruptured abdominal aortic aneurysm repair. Am Surg 1989;55:396-402. 11. Maerz L, Kaplan LJ. Abdominal compartment syndrome. Crit Care Med 2008;36:S212-5. 12. Moore EE, Burch JM, Franciose RJ, Offner PJ, Biffl WL. Staged physiologic restoration and damage control surgery. World J Surg 1998;22:1184-90. 13. Papavramidis TS, Duros V, Michalopoulos A, Papadopoulos VN, Paramythiotis D, Harlaftis N. Intra-abdominal pressure alterations after large pancreatic pseudocyst transcutaneous drainage. BMC Gastroenterol 2009;9:42. 14. De Laet IE, Malbrain M. Current insights in intra-abdominal hypertension and abdominal compartment syndrome. Med Intensiva 2007;31:88-99. 15. Sanchez NC, Tenofsky PL, Dort JM, Shen LY, Helmer SD, Smith RS. What is normal intra-abdominal pressure? Am Surg 2001;67:243-8. 16. Lerner SM. 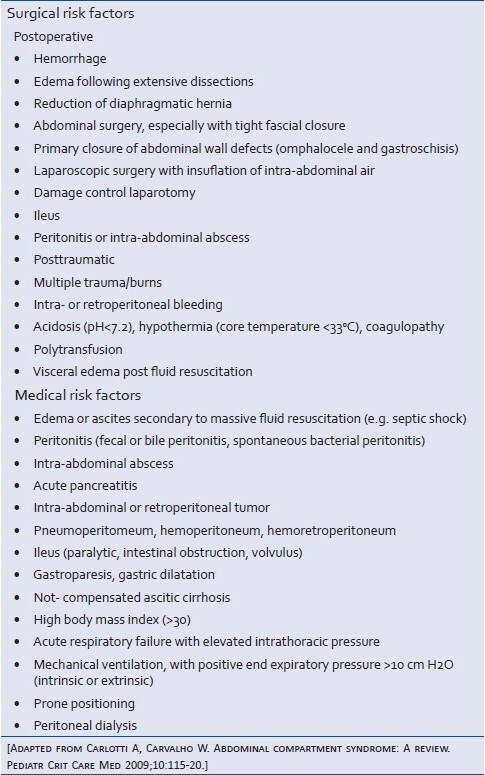 Review article: the abdominal compartment syndrome. Aliment Pharmacol 2008;28:377-84. 17. Cheatham ML, White MW, Sagraves SG, Johnson JL, Block EF. Abdominal perfusion pressure: A superior parameter in the assessment of intra-abdominal hypertension. J Trauma 2000;49:621-6. 18. Sugrue M, Jones F, Deane SA, Bishop G, Bauman A, Hillman K. Intra-abdominal hypertension is an independent cause of postoperative renal impairment. Arch Surg 1999;134:1082-5. 19. Sugrue M. Abdominal compartment syndrome. Curr Opin Crit Care 2005;11:333-8. 20. Lambert DM, Marceau S, Forse RA. Intra-abdominal pressure in the morbidly obese. Obes Surg 2005;15:1225-32. 21. Carlotti A, Carvalho W. Abdominal compartment syndrome: A review. Pediatr Crit Care Med 2009;10:115-20. 22. Malbrain ML, Deeren D, De Potter TJ. Intra-abdominal hypertension in the critically ill: it is time to pay attention. Curr Opin Crit Care 2005;11:156-71. 23. Grillner S, Nilsson J, Thorstensson A. Intra-abdominal pressure changes during natural movements in man. Acta Physiol Scand 1978;103:275-83. 24. Balogh Z, Moore FA, Moore EE, Biffl WL. Secondary abdominal compartment syndrome: A potential threat for all trauma clinicians. Injury 2007;38:272-9. 25. Wilson M, Dziewulski P. Severe gastrointestinal haemorrhage and ischemic necrosis of the small bowel in a child with 70% full-thickness burns: A case report. Burns 2001;27:763-6. 26. Cheatham ML, Malbrain ML, Kirkpatrick A, Sugrue M, Parr M, De Waele J, et al. Results from the International Conference of Experts on Intra-abdominal Hypertension and Abdominal Compartment Syndrome. II. Recommendations. Intensive Care Med 2007;33:951-62. 27. Sugrue M, Bauman A, Jones F, Bishop G, Flabouris A, Parr M, et al. Clinical examination is an inaccurate predictor of intra-abdominal pressure. World J Surg 2002;26:1428-31. 28. Malbrain ML. Abdominal pressure in the critically ill. Curr Opin Crit Care 2000;6:17-29. 29. Schachtrupp A, Henzler D, Orfao S, Schaefer W, Schwab R, Becker P, et al. Evaluation of a modified piezoresistive technique and a water-capsule technique for direct and continuous measurement of intra-abdominal pressure in a porcine model. Crit Care Med 2006;34:74-50. 30. Malbrain M. Different techniques to measure intra-abdominal pressure (IAP): Time for a critical re-appraisal. Intensive Care Med 2004;30:357-71. 31. Shear W, Rosner MH. Acute kidney dysfunction due to the abdominal compartment syndrome. J Nephrol 2006;19:556-65. 32. Reed SF, Britt RC, Collins J, Weireter L, Cole F, Britt LD. Aggressive surveillance and early catheter-directed therapy in the management of intra-abdominal hypertension. J Trauma 2006;61:1359-65. 33. De Waele JJ, Cheatham ML, Malbrain ML, Kirkpatrick AW, Sugrue M, Balogh Z, et al. Recommendations for research from the International Conference of Experts on Intra-abdominal Hypertension and Abdominal Compartment Syndrome. Acta Clin Belg 2009;64:203-9. 34. Cheatham ML. Nonoperative management of intraabdominal hypertension and abdominal compartment syndrome. World J Surg 2009;33:1116-22. 35. Malbrain ML, Chiumello D, Pelosi P, Bihari D, Innes R, Ranieri VM, et al. Incidence and prognosis of intraabdominal hypertension in a mixed population of critically ill patients: a multiple-center epidemiological study. Crit Care Med 2005;33:315-22. 36. Cheatham ML. Abdominal compartment syndrome: pathophysiology and definitions. Scand J Trauma Resusc Emerg Med 2009;17:10. 37. Malbrain ML, De laet IE. Intra-abdominal hypertension: Evolving concepts. Clin Chest Med 2009;30:45-70. 38. Kashtan J, Green JF, Parsons EQ, Holcroft JW. Hemodynamic effect of increased abdominal pressure. J Surg Res 1981;30:249-55. 39. Ridings PC, Bloomfield GL, Blocher CR, Sugerman HJ. Cardiopulmonary effects of raised intra-abdominal pressure before and after intravascular volume expansion. J Trauma 1995;39:1071-5. 40. Richardson JD, Trinkle JK. Hemodynamic and respiratory alterations with increased intra-abdominal pressure. J Surg Res 1976;20:401-4. 41. Malbrain ML, Cheatham ML. Cardiovascular effects and optimal preload markers in intra-abdominal hypertension. In: Vincent JL, Editor. Yearbook of intensive care and emergency medicine. Berlin: Springer; 2004. p. 519-43. 42. Cheatham M, Malbrain M. Cardiovascular implications of elevated intra-abdominal pressure. In: Ivatury R, Cheatham M, Malbrain M, Sugrue M, Editors. Abdominal compartment syndrome. Georgetown: Landes Bioscience: 2006. p. 89-104. 43. Simon RJ, Friedlander MH, Ivatury RR, DiRaimo R, Machiedo GW. Hemorrhage lowers the threshold for intra-abdominal hypertension-induced pulmonary dysfunction. J Trauma 1997;42:398-403. 44. Pelosi P, Ravagnan I, Giurati G, Panigada M, Bottino N, Tredici S, et al. Positive end-expiratory pressure improves respiratory function in obese but not in normal subjects during anesthesia and paralysis. Anesthesiology 1999;91:1221-31. 45. Sugrue M, D'Amours S. The problems with positive end expiratory pressure (PEEP) in association with abdominal compartment syndrome (ACS). J Trauma 2001;51:419-20. 46. Sussman AM, Boyd CR, Williams JS, DiBenedetto RJ. Effect of positive end-expiratory pressure on intra-abdominal pressure. South Med J 1991;84:697-700. 47. Bloomfield GL, Ridings PC, Blocher CR, Marmarou A, Sugerman HJ. A proposed relationship between increased intraabdominal, intrathoracic, and intracranial pressure. Crit Care Med 1997;25:496-503. 48. Cheatham ML, Block EF, Nelson LD, Safcsak K. Superior predictor of the hemodynamic response to fluid challenge in critically ill patients. Chest 1998;114:1226-7. 49. Cheatham ML, Nelson LD, Chang MC, Safcsak K. Right ventricular end-diastolic volume index as a predictor of preload status in patients on positive end-expiratory pressure. Crit Care Med 1998;26:1801-6. 50. Schachtrupp A, Graf J, Tons C, Hoer J, Fackeldey V, Schumpelick V. Intravascular volume depletion in a 24-hour porcine model of intra-abdominal hypertension. J Trauma 2003;55:734-40. 51. Michard F, Alaya S, Zarka V, Bahloul M, Richard C, Teboul JL. Global end-diastolic volume as an indicator of cardiac preload in patients with septic shock. Chest 2003;124:1900-8. 52. Michard F, Teboul JL. Predicting fluid responsiveness in ICU patients: A critical analysis of the evidence. Chest 2002;121:2000-8. 53. Duperret S, Lhuillier F, Piriou V, Vivier E, Metton O, Branche P, et al. Increased intra-abdominal pressure affects respiratory variations in arterial pressure in normovolaemic and hypovolaemic mechanically ventilated healthy pigs. Intensive Care Med 2007;33:163-71. 54. Malbrain ML, De Laet I. Functional haemodynamics during intra-abdominal hypertension: What to use and what not use. Acta Anaesthesiol Scand 2008;52:576-7. 55. Barnes GE, Laine GA, Giam PY, Smith EE, Granger HJ: Cardiovascular responses to elevation of intra-abdominal hydrostatic pressure. Am J Physiol 1985;248:R208-13. 56. Cheatham ML. Abdominal compartment syndrome: pathophysiology and definitions. Scand J Trauma Resusc Emerg Med 2009;17:10. 57. Goodale RL, Beebe DS, McNevin MP, Boyle M, Letourneau JG, Abrams JH, et al. Hemodynamic, respiratory, and metabolic effects of laparoscopic cholecystectomy. Am J Surg 1993;166:533-7. 58. Watson RA, Howdieshell TR. Abdominal compartment syndrome. South Med J 1998;91:326-32. 59. MacDonnell SP, Lalude OA, Davidson AC. The abdominal compartment syndrome: the physiological and clinical consequences of elevated intra-abdominal pressure. J Am Coll Surg 1996;183:419-20. 60. Ranieri VM, Brienza N, Santostasi S, Puntillo F, Mascia L, Vitale N, et al. Impairment of lung and chest wall mechanics in patients with acute respiratory distress syndrome: role of abdominal distension. Am J Respir Crit Care Med 1997;156:1082-91. 61. Gattinoni L, Pelosi P, Suter PM, Pedoto A, Vercesi P, Lissoni A. Acute respiratory distress syndrome caused by pulmonary and extrapulmonary disease. Different syndromes? Am J Respir Crit Care Med 1998;158:3-11. 62. Quintel M, Pelosi P, Caironi P, Meinhardt JP, Luecke T, Herrmann P, et al. An increase of abdominal pressure increases pulmonary edema in oleic acid-induced lung injury. Am J Respir Crit Care Med 2004;169:534-41. 63. Richards WO, Scovill W, Shin B, Reed W. Acute renal failure associated with increased intra-abdominal pressure. Ann Surg 1983;197:183-7. 64. Shenasky JH. The renal hemodynamic and functional effects of external counterpressure. Surg Gynecol Obstet 1972;134:253-8. 65. Doty JM, Saggi BH, Blocher CR, Fakhry I, Gehr T, Sica D, et al. Effects of increased renal parenchymal pressure on renal function. J Trauma 2000;48:874-7. 66. Doty JM, Saggi BH, Sugerman HJ, Blocher CR, Pin R, Fakhry I, et al. Effect of increased renal venous pressure on renal function. J Trauma 1999;47:1000-3. 67. Sugrue M, Hallal A, D'Amours S. Intra-abdominal pressure hypertension and the kidney. In: Ivatury R, Cheatham M, Malbrain M, Sugrue M, Editors. Abdominal compartment syndrome. Georgetown (TX): Landes Bioscience; 2006. p. 119-28. 68. Sugrue M, Buist MD, Hourihan F, Deane S, Bauman A, Hillman K. Prospective study of intra-abdominal hypertension and renal function after laparotomy. Br J Surg 1995;82:235-8. 69. Kirkpatrick AW, Colistro R, Laupland KB, Fox DL, Konkin DE, Kock V, et al. Renal arterial resistive index response to intraabdominal hypertension in a porcine model. Crit Care Med 2006;35:207-13. 70. Bloomfield GL, Blocher CR, Fakhry IF, Sica DA, Sugerman HJ. Elevated intra-abdominal pressure increases plasma renin activity and aldosterone levels. J Trauma 1997;42:997-1004. 71. Ulyatt DB. Elevated intra-abdominal pressure. Aust Anaes 1992; 10:108-14. 72. Luca A, Feu F, García-Pagán JC, Jiménez W, Arroyo V, Bosch J, et al. Favorable effects of total paracentesis on splanchnic hemodynamics in cirrhotic patients with tense ascites. Hepatology 1994;20:30-3. 73. Smith JH, Merrell RC, Raffin TA. Reversal of postoperative anuria by decompressive celiotomy. Arch Intern Med 1985;145:553-4. 74. Unsal MA, Imamoðlu M, Cay A, Kadioglu M, Aydin S, Ulku C, et al . Acute alterations in biochemistry, morphology and contractility of rat isolated urinary bladder via increased intra-abdominal pressure. Gynecol Obstet Invest 2006;61:179-87. 75. Friedlander MH, Simon RJ, Ivatury R, DiRaimo R, Machiedo GW. Effect of hemorrhage on superior mesenteric artery flow during increased intra-abdominal pressures. J Trauma 1998;45:433-89. 76. Caldwell CB, Ricotta JJ. Changes in visceral blood flow with elevated intraabdominal pressure. J Surg Res 1987;43:14-20. 77. Reintam A, Parm P, Kitus R, Starkopf J, Kern H. Gastrointestinal Failure score in critically ill patients: a prospective observational study. Crit Care 2008;12:R90. 78. Sugrue M, Jones F, Janjua KJ, Deane SA, Bristow P, Hillman K. Temporary abdominal closure: A prospective evaluation of its effects on renal and respiratory physiology. J Trauma 1998;45:914-21. 79. Diebel LN, Dulchavsky SA, Brown WJ. Splanchnic ischemia and bacterial translocation in the abdominal compartment syndrome. J Trauma 1997;43:852-5. 80. Diebel LN, Dulchavsky SA, Wilson RF. Effect of increased intra-abdominal pressure on mesenteric arterial and intestinal mucosal blood flow. J Trauma 1992;33:45-8. 81. Malbrain ML, De Laet I. AIDS is coming to your ICU: Be prepared for acute bowel injury and acute intestinal distress syndrome. Intensive Care Med 2008;34:1565-9. 82. Khripun AI, Ettinger AP, Chadaev AP, Tat'kov SS. Changes in the contractile and bioelectrical activities of the rat small intestine under increased intra-abdominal pressure. Izv Akad Nauk Ser Biol 1997;5:596-602. 83. Dodds WJ, Hogan WJ, Stewart ET, Stef JJ, Arndorfer RC. Effects of increased intra-abdominal pressure on esophageal peristalsis. J Appl Physiol 1974;37:378-83. 84. Unsal MA, Imamoglu M, Kadioglu M, Aydin S, Ulku C, Kesim M, et al. The acute alterations in biochemistry, morphology, and contractility of rat-isolated terminal ileum via increased intra-abdominal pressure. Pharmacol Res 2006;53:135-41. 85. Mogilner JG, Bitterman H, Hayari L, Brod V, Coran AG, Shaoul R, et al. Effect of elevated intra-abdominal pressure and hyperoxia on portal vein blood flow, hepatocyte proliferation and apoptosis in a rat model. Eur J Pediatr Surg 2008;18:380-6. 86. Diebel LN, Wilson RF, Dulchavsky SA, Saxe J. Effect of increased intra-abdominal pressure on hepatic arterial, portal venous, and hepatic microcirculatory blood flow. J Trauma 1992;33:279-82. 87. Wendon J, Biancofiore G, Auzinger G. Intraabdominal hypertension and the liver. In: Ivatury R, Cheatham M, Malbrain M, Sugrue M, Editors. Abdominal compartment syndrome. Georgetown (TX): Landes Bioscience; 2006. p. 138-43. 88. Cade R, Wagemaker H, Vogel S, Mars D, Hood-Lewis D, Privette M, et al. Hepatorenal syndrome. Studies of the effect of vascular volume and intraperitoneal pressure on renal and hepatic function. Am J Med 1987;82:427-38. 89. Nakatani T, Sakamoto Y, Kaneko I, Ando H, Kobayashi K. Effects of intra-abdominal hypertension on hepatic energy metabolism in a rabbit model. J Trauma 1998;44:446-53. 90. Luca A, Cirera I, García-Pagán JC, Feu F, Pizcueta P, Bosch J, et al. Hemodynamic effects of acute changes in intra-abdominal pressure in patients with cirrhosis. Gastroenterology 1993;104:222-7. 91. Burchard KW, Ciombor DM, McLeod MK, Slothman GJ, Gann DS. Positive end expiratory pressure with increased intraabdominal pressure. Surg Gynecol Obstet 1985;161:313-8. 92. Biancofiore G, Bindi ML, Boldrini A, Consani G, Bisà M, Esposito M, et al. Intraabdominal pressure in liver transplant recipients: incidence and clinical significance. Transplant Proc 2004;36:547-9. 93. Biancofiore G, Bindi ML, Romanelli AM, Boldrini A, Consani G, Bisà M, et al. Intra abdominal pressure monitoring in liver transplant recipients: a prospective study. Intensive Care Med 2003;29:30-6. 94. Deeren DH, Dits H, Malbrain ML. Correlation between intra-abdominal and intracranial pressure in nontraumatic brain injury. Intensive Care Med 2005;31:1577-81. 95. Josephs LG, Este-McDonald JR, Birkett DH, Hirsch EF. Diagnostic laparoscopy increases intracranial pressure. J Trauma 1994;36:815-8. 96. Bloomfield GL, Ridings PC, Blocher CR, Marmarou A, Sugerman HJ. Effects of increased intra-abdominal pressure upon intracranial and cerebral perfusion pressure before and after volume expansion. J Trauma 1996;40:936-41. 97. Citerio G, Vascotto E, Villa F, Celotti S, Pesenti A. Induced abdominal compartment syndrome increases intracranial pressure in neurotrauma patients: A prospective study. Crit Care Med 2001;29:1466-71. 98. Citerio G, Berra L. Intraabdominal hypertension and the central nervous system. In: Ivatury R, Cheatham M, Malbrain M, Sugrue M, Editors. Abdominal compartment syndrome. Georgetown (TX): Landes Bioscience; 2006. p. 144-56. 99. Halverson AL, Barrett WL, Iglesias AR, Lee WT, Garber SM, Sackier JM. Decreased cerebrospinal fluid absorption during abdominal insufflation. Surg Endosc 1999;13:797-800. 100. Irgau I, Koyfman Y, Tikellis JI. Elective intraoperative intracranial pressure monitoring during laparoscopic cholecystectomy. Arch Surg 1995;130:1011-3. 101. Joseph DK, Dutton RP, Aarabi B, Scalea TM. Decompressive laparotomy to treat intractable intracranial hypertension after traumatic brain injury. J Trauma 2004;57:687-93. 102. Diebel L, Saxe J, Dulchavsky S. Effect of intra-abdominal pressure on abdominal wall blood flow. Am Surg 1992;58:573-5. 103. Mutoh T, Lamm WJ, Embree LJ, Hildebrandt J, Albert RK. Volume infusion produces abdominal distension, lung compression, and chest wall stiffening in pigs. J Appl Physiol 1992;72:575-82. 104. Daugherty EL, Hongyan Liang, Taichman D, Hansen-Flaschen J, Fuchs BD. Abdominal compartment syndrome is common in medical intensive care unit patients receiving large-volume resuscitation. J Intensive Care Med 2007;22:294-9. 105. Balogh Z, McKinley BA, Holcomb JB, Miller CC, Cocanour CS, Kozar RA, et al. Both primary and secondary abdominal compartment syndrome can be predicted early and are harbingers of multiple organ failure. J Trauma 2003;54:848-59. 106. Ivatury RR, Porter JM, Simon RJ, Islam S, John R, Stahl WM. Intra-abdominal hypertension after life-threatening penetrating abdominal trauma: prophylaxis, incidence, and clinical relevance to gastric mucosal pH. J Trauma 1998;44:1016-21. 107. Balogh Z, Caldwell E, Heetveld M, D'Amours S, Schlaphoff G, Harris I, et al. Institutional practice guidelines on management of pelvic fracture-related hemodynamic instability: do they make a difference? J Trauma 2005;58:778-82. 108. Horwood J, Akbar F, Maw A. Initial experience of laparostomy with immediate vacuum therapy in patients with severe peritonitis. Ann R Coll Surg Engl 2009;91:681-7. 109. Sugrue M, Buhkari ÆY. Intra-Abdominal Pressure and Abdominal Compartment Syndrome in Acute General Surgery. World J Surg 2009;33:1123-7. 110. Polat C, Arikan Y, Vatansev C, Akbulut G, Yilmaz S, Dilek FH, et al. The effect of increased intraabdominal pressure on colonic anastomosis. Surg Endosc 2002;16:1314-9. 111. Ivatury RR, Sugerman HJ. Abdominal compartment syndrome: a century later, isn't it time to pay attention? Crit Care Med 2000;28:2137-8. 112. Mayberry JC, Mullins RJ, Crass RA. Prevention of abdominal compartment syndrome by absorbable mesh prosthesis closure. Arch Surg 1997;9:957-61. 113. Hakkiluoto A, Hannukainen J. Open management with mesh and zipper of patients with intra-abdominal abscesses or diffuse peritonitis. Eur J Surg 1992;158:403-5. 114. Akers DL, Fowl RJ, Kempczinski RF. Temporary closure of the abdominal wall by use of silicone rubber sheets after operative repair of ruptured abdominal aortic aneurysms. J Vasc Surg 1991;14:48-52. 115. Wild JM, Loundon MA. Modified Opsite sandwich for temporary abdominal closure: a non-traumatic experience. Ann R Coll Surg Engl 2007;89:57-61. 116. Kirshtein B, Roy-Shapira A, Lantsberg L, Mizrahi S. Use of the "Bogotá bag" for temporary abdominal closure in patients with secondary peritonitis. A m J Surg 2007;73:249-52. 117. Pliakos I, Papavramidis TS, Mihalopoulos N, Koulouris H, Kesisoglou I, Konstantinos Sapalidis, et al. Vacuum Assisted closure in severe abdominal sepsis with or without retention sutured sequential fascial closure: a clinical trial. Surgery 2010; In press. 119. Nagy KK, Fildes JJ, Mahr C. Experience with three prosthetic materials in temporary abdominal wall closure. Am J Surg 1996;5:331-5. 120. Tekin S, Tekin A, Kucukkartallar T, Cakir M, Kartal A. Use of chorioamniotic membrane instead of Bogotá bag in open abdomen: How I Do It? World J Gastroenterol 2008;14:815-6. 121. Stone HH, Fabian TC, Turkleson ML, Jurkiewicz MJ. 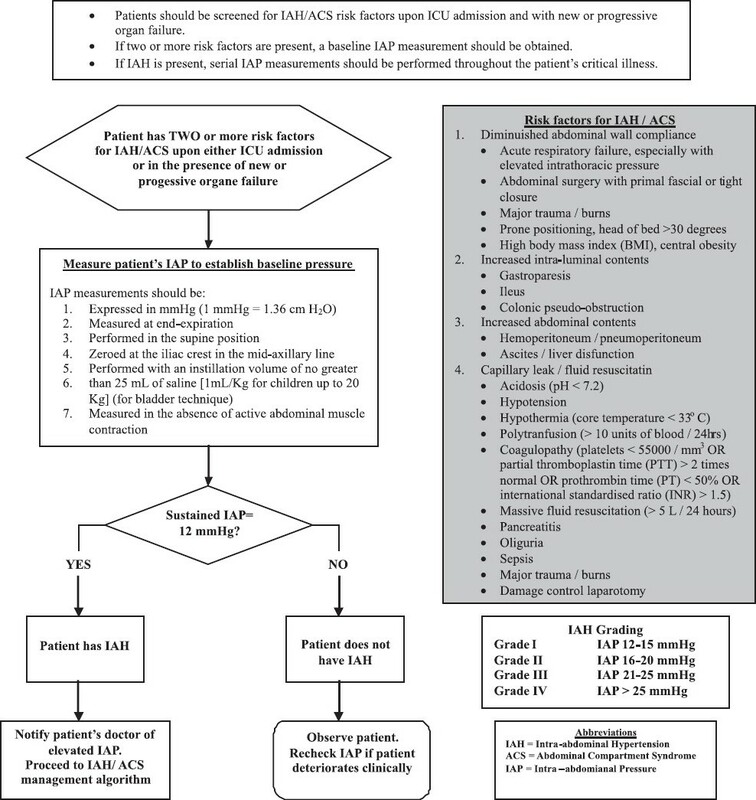 Management of acute full-thickness losses to the abdominal wall. Ann Surg 1981;193:612-8. 122. Fry DE, Osler T. Abdominal wall considerations and complications in reoperative surgery. Surg Clin North Am 1991;71:1-11. 123. Miller PR, Thompson JT, Faler BJ, Meredith JW, Chang MC. Late fascial closure in lieu of ventral hernia: the next step in open abdomen management J Trauma 2002;53:843-9. 124. Jernigan TW, Fabian TC, Croce MA, Moore N, Pritchard FE, Minard G, et al. Staged management of giant abdominal wall defects: acute and long-term results. Ann Surg 2003;238:349-55. 125. Deligiannidis N, Papavramidis T, Papavramidis S, Gkoutzamanis G, Kessissoglou I, Papavasiliou I, et al. Two different prosthetic materials in the treatment of large abdominal wall defects. N Z Med J 2008;121:19-24. 126. Bee TK, Croce MA, Magnotti LJ, Zarzaur BL, Maish GO 3 rd , Minard G, et al. Temporary abdominal closure techniques: A prospective randomized trial comparing polyglactin 910 mesh and vacuum-assisted closure. J Trauma 2008;65:337-42. 127. Cothren CC, Moore EE, Johnson JL, Moore JB, Burch JM. One hundred percent fascial approximation with sequential abdominal closure of the open abdomen. Am J Surg 2006;192:238-42. 128. Reimer MW, Yelle JD, Reitsma B, Doumit G, Allen MA, Bell MS. Management of open abdominal wounds with a dynamic fascial closure system Can J Surg 2008;51:209-14. 129. Tieu BH, Cho SD, Luem N, Riha G, Mayberry J, Schreiber MA. The use of the Wittmann Patch facilitates a high rate of fascial closure in severely injured trauma patients and critically ill emergency surgery patients. J Trauma 2008;65:865-70. 130. Poulakidas S, Kowal-Vern A. Component separation technique for abdominal wall reconstruction in burn patients with decompressive laparotomies J Trauma 2009;67:1435-8. 131. Kushimoto S, Miyauchi M, Yokota H, Kawai M. Damage control surgery and open abdominal management: recent advances and our approach. J Nippon Med Sch 2009;76:280-90. 132. Open Abdomen Advisory Panel. Management of the open abdomen: from initial operation to definitive closure. Am Surg 2009;75:S1-22. 133. Cheatham ML, Safcsak K. Is the evolving management of intra abdominal hypertension and abdominal compartment syndrome improving survival? Crit Care Med 2010;38:402-7. Mavrodin, C.I. and Pariza, G. and Ion, D. and Antoniac, V.I. Jaekers, J. and Van Melkebeek, J. and Van Cleemput, M. and Van Riet, R.
Du, W.-H. and Xiang, W. and Liu, D.-C. and Zhang, L.-Y. and Li, T. and Sun, S.-J. and Tan, H.
GonzÃ¡lez, L. and RodrÃ­guez, R. and MencÃ­a, S. and Gil-Ruiz, M. and Sanavia, E. and LÃ³pez Herce, J.
Pliakos, I. and Papavramidis, T.S. and Michalopoulos, N. and Deligiannidis, N. and Kesisoglou, I. and Sapalidis, K. and Papavramidis, S.
Lee, E.S. and Ohk, T.G. and Lee, W.W. and Park, S.M. and Ahn, J.Y. and Sohn, Y.D. and Ahn, H.C.
Papavramidis, T.S. and Kotidis, E. and Ioannidis, K. and Duros, V. and Cheva, A. and Michalopoulos, A. and Papadopoulos, V.N. and Deligiannidis, N. and Papavramidis, S.